Note: To understand this chapter, you must first have understood the concept of electric field, which is covered in the previous chapter. Electric potential energy is the potential energy for the electrostatic force. Electric potential is the electric potential energy per unit charge. But only differences in potential energy are meaningful; only the difference in potential (potential difference) is measurable. From this equation, we can see that the unit of potential difference is the unit of energy, joules (J), divided by the unit of charge, coulomb (C), or J/C, and we give it a new name, volt (V). We also give potential difference a simplified name, voltage. Unlike like electric field lines, which originate from the charge and goes outward if the charge is positive and goes inward if the charge is negative, equipotential lines are concentric circles (circles with one center). Here, electric field line is shown in golden, equipotential lines are shown in blue. Electric field and force are both vectors, but electric potential is a scalar. It is defined as the energy acquired by a particle carrying a charge whose magnitude equals that on the electron as a result of moving through a potential difference of 1V. Assuming that Q is constant, as the distance r increases, the electric potential V decreases. V varies inversely as r. Recall that electric field varies inversely as r^2. What about the electric potential in a charged sphere? Recall in chapter 16 that electric field is zero within the sphere, but the electric potential is a constant (kQ/r) within the sphere. A capacitor is a device that can store electric charge, and consists of two conducting objects placed near each other but not touching. If a voltage is applied across a capacitor, the two plates are charged. 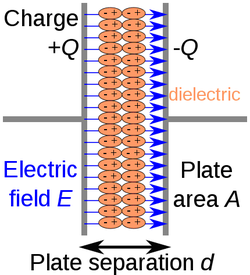 Charge is accumulated on each plate, and it is found that the amount of charge Q is directly proportional to the magnitude of the potential difference V between them. Capacitance is measured in coulombs per volt, and is given a new name called farad (F). What determines the capacitance of a capacitor? As the capacitor accumulates the charge, its electric energy is also increasing. 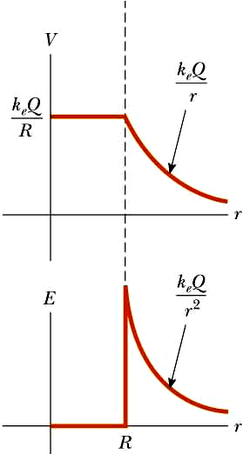 The QV graph is a upward sloping curve with a constant slope, capacitance. The area under the QV graph then, is the electric energy.